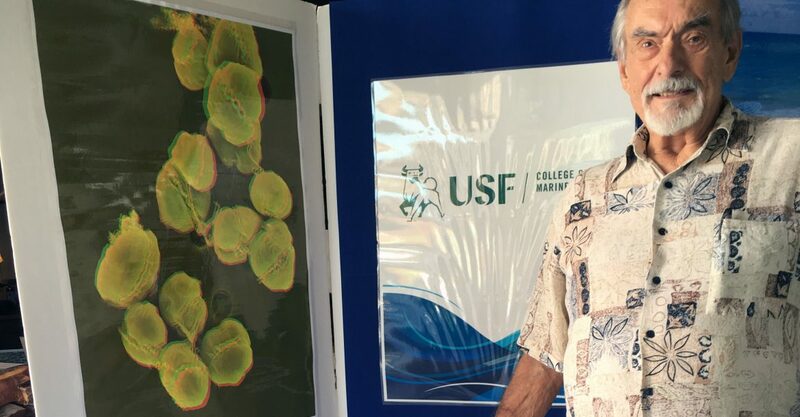 ENGLEWOOD, FL – Dr. Gabe Vargo, Associate Professor Emeritus, is one of those members of the USF College of Marine Science (CMS) community who is technically retired but officially busier than ever. Since his retirement in early 2008 Vargo has spent a lot of his time putting his falconry skills to work on the birds of prey housed at the Boyd Hill Nature Preserve in St. Petersburg, FL, of which he is a charter member; serving on the Board of Directors for the St. Petersburg Audubon Society; tracking short-tailed hawks and shallow-tailed kites to inspire teachers and students; and much more. In a public talk held at the Manasota Beach Club in Englewood, Florida on Monday, February 4, he re-donned his proverbial red tide professor hat and shared his insights from decades of research on Karenia brevis, the phytoplankton species to blame for the seemingly endless red tide experienced along parts of the Gulf Coast since the end of 2017. His presentation, “Florida red tide: understanding the history, hazards, and chutzpah of Karenia brevis,” held the audience captive – no surprise given that the devastating impact the red tide has had on this Gulf coast community. One take-away message: many of the key questions Vargo and other scientists have been asking for decades — such as specifically how a red tide starts in offshore waters, how and why it ends, and if there’s something we can do about it in a responsible manner – continue to perplex the scientific community. Scientists at the USFCMS have made tremendous progress in their ability to predict where a red tide bloom will move along the coast, but many questions remain about the complex biology of the organism, well known for its ability to harm and kill wildlife, close shellfish beds, and irritate human beings with its cough-inducing toxin that gets stirred up in windy conditions. The audience left understanding that this year’s red tide, while seemingly endless, fits within the historical profile of this tiny plant that lives year-round in Gulf waters.